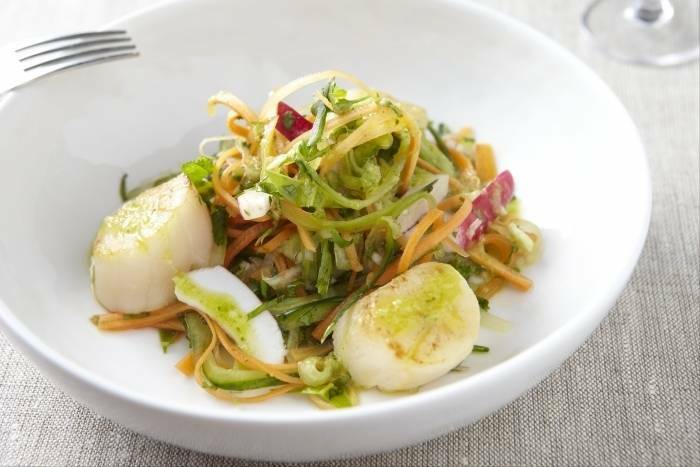 Pan fried scallops served with thinly sliced vegetables dressed with lime juice, fish sauce and fresh herbs. Prepare the scallops by removing from the shell and discard the roe. Wash under cold water and dry on paper towel. Peel and thinly slice the carrots and cucumber on a mandolin. Finely slice the shallot, lemongrass and lime leaves. Finely dice the garlic, chillies and ginger. Slice the coconut. Trim and cut the radishes into quarters. Chop the coriander and mint leaves. Keep the stalks from the coriander for the vinaigrette. Place the carrot and cucumber in a colander and season lightly with salt. Cut one of the limes into 6 wedges for garnish. Juice the remaining three. In a pestle and mortar pound the coriander root with a clove of garlic and a pinch of salt until pureed. Add the lime juice, caster sugar and fish sauce. Add some of the diced red chilli to taste. Adjust with sugar, fish sauce and lime juice if required. Heat a frying pan until very hot. Season the scallops with salt and add the oil to the pan. Cook the scallops until golden brown on both sides. Mix the carrot and cucumber with the shallot, garlic, chilli, ginger, lime leaves and lemongrass. Add the chopped herbs and then dress with the vinaigrette. Place a mound of salad in the middle of the plate. Add some coconut slices and radishes to the plate. Top with the scallops and finish with a drizzle of any remaining vinaigrette and a wedge of lime.